Dear readers, friends and believers, last week I blogged about the sparrow due a financial situation that I was facing. The text for the blog was found in part of the Beatitudes which is located in the sixth Chapter of Matthew. Well since last week I spoke about sparrows, it is my guess that God has a wonderful sense of humor because this week I will be talking to you about Eagles. cause I was studying this week but today I finished one of the final exams to which I got 80% on. I was shocked as any other man. However I would like take some time to share with all of you just exactly what I have learned this week of studying and sitting at the very feet of heaven. A portion of this blog post will actually deal with an essay question and the answer I provided to said question. However before your eyes can go any further on in reading this article, it is very important that you first read last week’s entry. His eye is on the Sparrow. Up until this week I never really saw Eagles from a Christian perspective before but after my exam and constant studying over the past month. 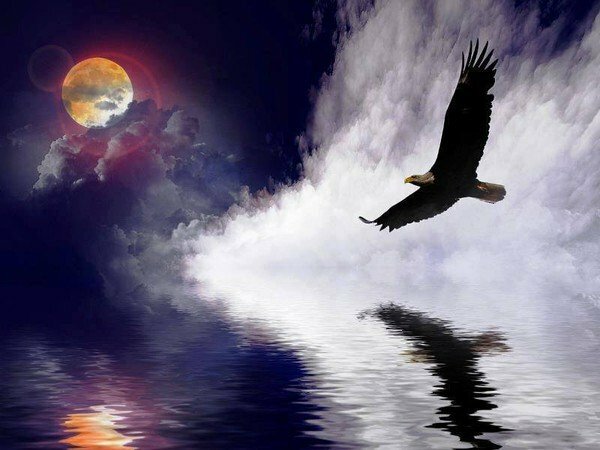 I see the beauty and strength in this wonderful creature called the Eagle. I would first like to state that I take absolutely no credit for this blog post. This blog post came about after the teaching of the Holy Spirit. All the Glory, Praise and Honour goes to God. I am a mere man, apart from God I can do nothing. He is the potter and I am just clay ready for his molding. These are the very things I learned while sitting at the feet of Jesus this month. If the Lord is taking you to the Potter’s House it means he wants to make you fitting more into the image of his Son Jesus. God’s only son pleased the father everyday that he was here on earth so why consider it a bad thing to go to the Potter’s house? Most humans who don’t know about trials, temptations and or tribulation don’t know the real Jesus. The enemy convinces them to make one up as they go along trying to live the Godly life in public but behind closed doors when the spirit of Heaven awakens them with a opportunity to overcome a trial. Some rise and some fall. We as children of God have to know that God is in control of every situation if we ask him to guide us. However we get into trouble when we jump ahead of him or leg behind not to mention if go into the valley and don’t see the Lord in it than I compel you all to tuck your Bible under your arm and run until you can come to see God in the storm. Standing Man’s Way & Standing God’s Way! Believe me when I say this there is a vast difference. ut the storm, however before I left my housing unit I took to the internet to write about the problem. Don’t try that at home kids. I was weak in the moment and I should have thought it through and prayed about it. Standing God’s Way is completely different. Standing God’s Way means to stand on truth. Standing God’s way means to stand on faith not feelings. As you use the word to guide your steps you’re going to be alright. That’s what Eagles do. Now why am I talking about all of this because no matter what I have gone through I have stood for truth. Have I shed a few tears? the answer to that question is yes. Many have seen it. The flesh can be weak but the spirit is very willing. Throughout this past year, I have lost a few members of my blood family. Which at first was sad and devastating in the moment but why would I want to go to Egypt to be tortured for my faith. Just like there was nothing for Israel than there is nothing for Christians in the Land of Egypt now. Now A days I look to the people of God to be my family. I have more family in God these days than I ever did from an earthly standpoint. The reason I say this all is for a very special reason. Some of the greatest trials can become our greatest triumphs. We have a choice in how to respond to difficult situations. In the flesh we can allow ourselves to be sparrows and allow the storms to beat us up or we can get up off the ground and mount up like an eagle and use the disappointments in life to place our faith in God. At the end of the day will you sputter like sparrow or Soar like the Eagle? How will you handle the trials and tribulations of life? Here is my essay response to that very question. When we can trust like the Psalmist than we can thank God for the valleys and that is how you turn a Trial into a Testimony this Tuesday Night.